Our Premium Fish and Sweet Potato Adult Dog Recipe includes whitefish, which is a novel protein source and a great alterntive for dogs with chicken allergy. Rich in Omega 3 & 6 for heatlhy heart. Our Bake to Nature Fish and Sweet Potato is Wheat, Corn and Soy Free and we do not add artificial colors, flavors, preservatives, or additives. Our Baked to Nature Fish and Sweet Potato does not contain ethoxyquin. Healthy Body Mass - We use quality animal protein sources such as whitefish to help maintain lean muscle mass. Balanced Nutrition - The perfect balance of protein, fat, carbohydrates and essential vitamins and minerals to help support everyday health. Digestive Health - We use wholesome grains and natural fiber to help maintain a healthy intestinal tract. Natural Vitamins and Antioxidants from tomatoes, carrots, blueberries, spinach and green tea. Heart, Skin and Coat Health - Whitefish and flax seed are rich in Mega-3 and -6 fatty acids to support a healthy heart and skin, and produce a shiny, soft coat. Guaranteed Great Taste - Flavor and aroma dogs love. Our premium Chicken Adult Formula oven baked dog food recipe uses essential protein as it's first and second ingredient. 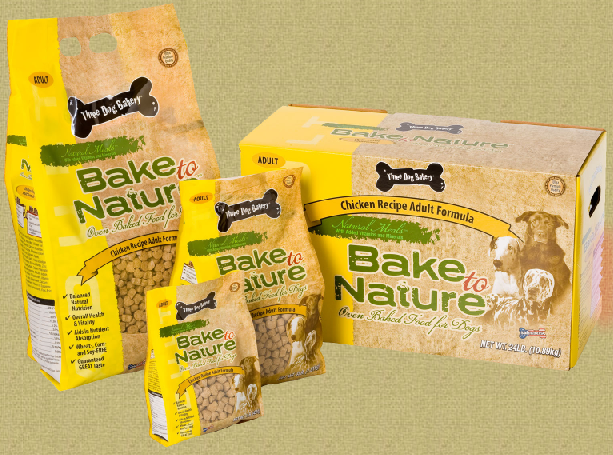 Our Bake to Nature Chicken Formula is Wheat, Corn and Soy Free and we do not add artificial colors, flavors, preservatives, or additives. Healthy Body Mass - We use quality animal protein sources such as chicken and chicken meal to help maintain lean muscle mass. Balance Nutrition - The perfect balance of protein, fat, carbohydrates and essential vitamins and minerals to help support everyday health. Whitefish, Fish Meal, Ground Brown Rice, Rice Bran, Ground Barley, Oatmeal, Rice, Flaxseed, Egg, Sweet Potatoes, Chicken Fat (Preserved Mixed Tocels), Calcium Carbonate, Dicalcium Phosphate, Choline Chloride, Potassium Chloride, Tomato Pomace, Taurine, Carrots, Spinach, Apples, Blueberries, Chickory Root Extract, Garlic, Yucca Schidigera Extract, Green Tea Extract, Minerals (Ferrous Sulfate, Zinc Sulfate, Zinc Proteinate, Copper Sulfate, Copper Proteinate, Manganous Oxide, Manganese Proteinate, Calcium Iodate, Sodium Selenite), Vitamins (Vitamin E Supplement, Vitamin B12, Vitamin A Supplement, Niacin Supplement, Calcium Pantothenate, Riboflavin Supplement, Vitamin D3 Supplement, Thiamine Mononitrate, Pyrodoxine Hydrochloride, Folic Acid, Beta Carotene). Natural Meals Bake to Nature Oven Baked Food for Dogs Fish & Sweet Potato Recipe Adult Formula is formulated to meet the nutritional levels established by the AAFCO Food Nutrient Profiles for maintenance. Natural Meals Bake to Nature Oven Baked Food for Dogs Chicken Recipe Adult Formula is formulated to meet the nutritional levels established by the AAFCO Food Nutrient Profiles for maintenance. Our premium Chicken Healthy Weight Adult Formula oven baked dog food recipe has less calories and lower in fat than our other adult food recipes. Feeding directions for both weight loss and maintenance on every bag. Digestive Health - We use wholesome grains and natural fiber to help maintain a healthy intestinal tract. Natural Vitamins and Antioxidants from tomatoes, carrots, blueberries, spinach and green tea. Hip & Joint - We add natural sources of glucosamine and chondroitin to help promote hip and joint health. Satisfies Hunger - To satisfy hunger between meals, we fortify our Healthy Weight recipe with healthy fiber. 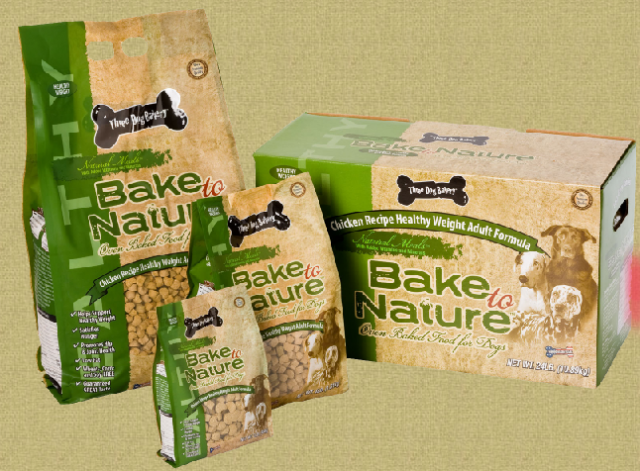 Natural Meals™ Bake to Nature™ Oven Baked Food for Dogs Chicken Recipe Healthy Weight Adult Formula is formulated to meet the nutritional levels established by the AAFCO Food Nutrient Profiles for maintenance. Chicken, Ground Brown Rice, Rice Bran, Ground Barley, Rice, Chicken Meal, Oatmeal, Alfalfa Meal, Dicalcium Phosphate, Calcium Carbonate, Choline Chloride, Potassium Chloride, Tomato Pomace, Taurine, Glucosamine Hydrochloride, Chondroitin Sulfate, Chicken Fat (Preserved Mixed Tocopherols), Carrots, Spinach, Apples, Blueberries, flaxseed, Chickory Root Extract, Garlic, Yucca Schidigera Extract, Green Tea Extract, Minerals (Ferrous Sulfate, Zinc Sulfate, Zinc Proteinate, Copper Sulfate, Copper Proteinate, Manganous Oxide, Manganese Proteinate, Calcium Iodate, Sodium Selenite), Vitamins (Vitamin E Supplement, Vitamin B12, Vitamin A Supplement, Niacin Supplement, Calcium Pantothenate, Riboflavin Supplement, Vitamin D3 Supplement, Thiamine Mononitrate, Pyrodoxine Hydrochloride, Folic Acid, Beta Carotene). Our premium Chicken Puppy Dog Formula is a natural source of DHA for brain development; quality carbohydrates for energy; calcium and phosphorus for strong teeth; and lean protein for muscle development. Our Bake to Nature Chicken Puppy Formula is Wheat, Corn and Soy Free and we do not add artificial colors, flavors, preservatives, or additives. Brain Development - The DHA level in every bag supports cognitive development, vital to training and learning. Strong Teeth and Bones - Our Puppy Recipe provides calcium and phosphorus--essential to the growth of strong teeth and bones. Healthy Energy - To promote digestive well-being, we use oatmeal, barley and brown rice for compact carbohydrates to provide your puppy with energy without using filler. 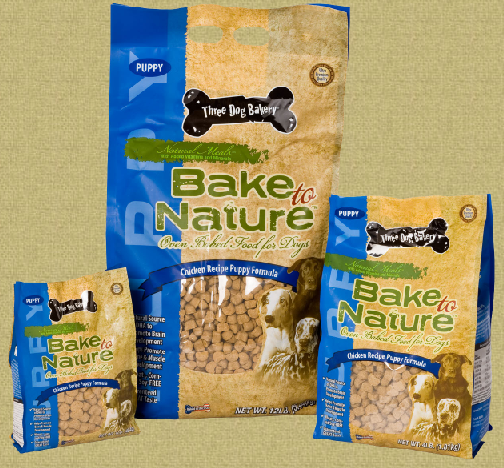 Natural Meals Bake to Nature Oven Baked Food for Dogs Chicken Recipe Puppy Formula is formulated to meet the nutritional levels established by the AAFCO Puppy Food Nutrient Profiles for growth. You don't have to wonder what is in your dogs' food. Three Dog Bakery's premium dog food will give you the peace of mind that your dog is receiving excellent nutrition for a happy, healthy, tail-wagging life! go ahead, give our kibble a nibble!